$14.95 list, but save 15% with discount code MGQ8JWWJ at checkout, and ensure greater royalties for the author, more support for independent publishing, and receive good shipping rates worldwide! WIN A FREE COPY: On December 1, we gave away a free paperback copy of this new book to one of our newsletter subscribers, so please sign up if you'd like to be eligible for future drawings, and to receive news and other exclusive special offers, 4-6 times per year, via email. 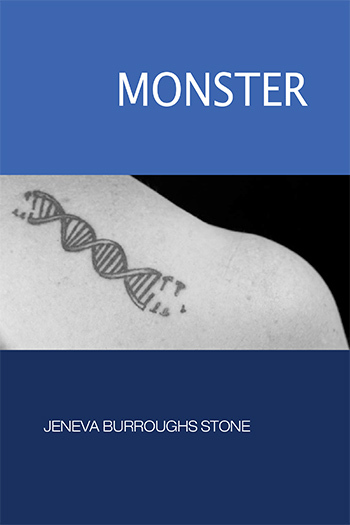 "Jeneva Burroughs Stone’s “Monster” does what seems impossible -- weaves together the threads of creating and caring for a child with significant disabilities with those of poetry, intricate intellectual observation and, above all, love and wonder for what is wrought." Interpreter of “the kid behind the curtain of my voice,” the passionate intellect of Jeneva Stone drives these mesmerizing reflections—memoir, meditation, original creation—when “what happens breaks covenant with every explanation in its path,” as she watches “a world shatter like ice.” These pages astonish with their continual inquiry, their candor, their sophisticated knowledge of science and literature, their metaphoric accrual of meanings—astonishing, the forms that love and brilliance can conjure out of chaos. Stone begins, “I fear love will be the force that breaks me.” It is, and it does, and she shows us what it is like to continue after that breakage. Her roving mind processes scientific research, the work of other writers, and the events of her days, and makes of these raw materials a “monstrous” book of verse and prose, a testament to broken continuance. Everyone who is interested in life should bear witness to Stone’s searching and scrupulous report on her son, sentenced by a genetic mutation to a life of extreme constraint, a life of almost pure being. It is the very definition of love. Jeneva Burroughs Stone has published poetry and essays in many literary journals, including The Colorado Review, Poetry International, Los Angeles Review of Books, and Pleiades. Her work in nonfiction has been honored with fellowships from the MacDowell and Millay Colonies. She holds an MFA from the Warren Wilson Program for Writers, a PhD from Columbia University, and a BA from Middlebury College. Jeneva does volunteer work for Rare Genomics Institute and CareGifted, the first dedicated to helping families of undiagnosed children find answers, the second to long-term caregiver respite. She is also a contributing editor to Pentimento: Journal of All Things Disability, which is dedicated to promoting the voices of caregivers and writers with disabilities. She lives in Bethesda, Maryland.